In 1960, 13-year-old Sophie isn't happy about spending the summer at her grandmother's old house in the Bayou. But the house has a maze Sophie can't resist exploring once she finds it has a secretive and mischievous inhabitant. When Sophie, bored and lonely, makes an impulsive wish, she slips back 100 years into the past, to the year 1860. She hopes for a fantasy book adventure with herself as the heroine. Instead, she gets a real adventure in the race-haunted world of her family's Louisiana sugar plantation in 1860, where she is mistaken for a slave. President Abraham Lincoln's Emancipation Proclamation is still two years in the future. The Thirteenth Amendment - abolishing and prohibiting slavery - will not be not passed until April 1864. Muddy and bedraggled, Sophie obviously isn't a young lady of good breeding. She must therefore be a slave. And she is. 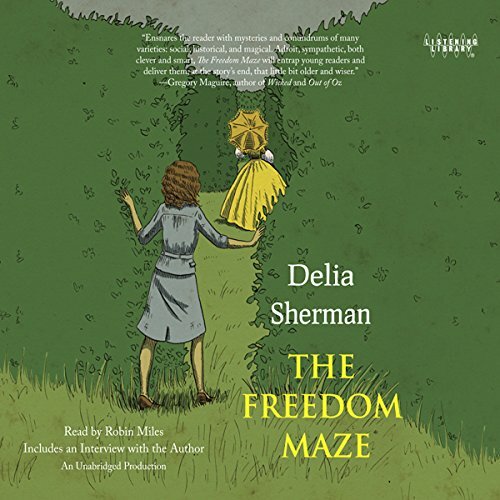 Where does The Freedom Maze rank among all the audiobooks you’ve listened to so far? I tend to read long, epic fantasy and science fiction books, so this purchase was a bit out of character, but I couldn't resist a tale of time travel mixed with historical fiction. This book is definitely up there as one of my favorite sub-10 hour audiobooks. I think it has some of the best regional dialect I've heard in a story, and the wonderful descriptions instantly transported me back to that period of the deep south. What does Robin Miles bring to the story that you wouldn’t experience if you had only read the book? Robin Miles did a great life of bringing the regional and period accents to life. I found myself totally immersed, and if I close my eyes, I could picture the bayou and plantation setting. Yes, very easy to listen to this book in one setting.